Travis Wofford was born on January 13, 1934, in Los Angeles, California. He was commissioned a 2d Lt in the U.S. Air Force through the Air Force ROTC program on May 30, 1956, and went on active duty beginning March 9, 1957. Lt Wofford next completed pilot training and was awarded his pilot wings at Bryan AFB, Texas, in June 1958. After completing KC-97 Stratotanker Combat Crew Training, Lt Wofford served as a KC-97 pilot with the 340th Air Refueling Squadron at Whiteman AFB, Missouri, from September 1958 to December 1961. His next assignment was as a KC-97 pilot with the 320th Air Refueling Squadron at March AFB, California, from December 1961 to July 1962, followed by service as a KC-135 Stratotanker pilot with the 93rd Air Refueling Squadron at Castle AFB, California, from July 1962 to August 1963. 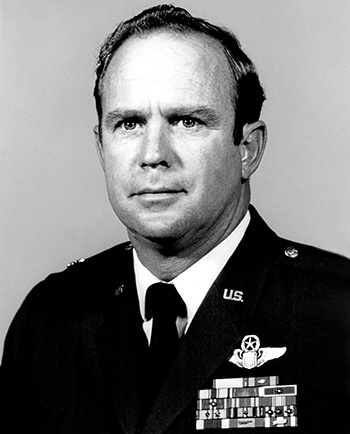 Capt Wofford next served as a KC-135 pilot with the 6th Air Refueling Squadron at Walker AFB, New Mexico, from August 1963 to January 1967, and then with the 70th Air Refueling Squadron at Little Rock AFB, Arkansas, from January 1967 to June 1969. After completing helicopter pilot training and HH-3E Jolly Green Giant Combat Crew Training, Maj Wofford served as an HH-3 pilot with the 37th Aerospace Rescue and Recovery Squadron at DaNang AB, South Vietnam, from December 1969 to August 1970, followed by service as a helicopter instructor pilot with the 3637th Flying Training Squadron at Sheppard AFB, Texas, from August 1970 to May 1971. He served as an instructor pilot and Chief of Aircrew Training with the 1550th Aircrew Training and Test Wing at Hill AFB, Utah, from May 1971 to April 1974, and then served as Commander of Detachment 13, 41st Aerospace Rescue and Recovery Wing at Osan AB, South Korea, from April 1974 to April 1975. Col Wofford's final assignment was on the staff of Headquarters Aerospace Rescue and Recovery Service at Scott AFB, Illinois, where he served as Chief of the Heavylift Helicopter Division, Assistant Director of the Aircrew Standardization Directorate, and as Director of the Operations and Training Directorate from May 1975 until his retirement from the Air Force on March 1, 1978. The President of the United States of America, authorized by Section 8742, Title 10, United States Code, awards the Air Force Cross to Major Travis Wofford for heroism in military operations against an opposing armed force as a rescue helicopter copilot near Dak Nay Puey, Republic of Vietnam, on 15 April 1970. On that date, Major Wofford was engaged in the rescue of a crew of a United States Army helicopter which was shot down by enemy ground fire. Although Major Wofford was wounded by enemy ground fire during two earlier rescue attempts, he chose to continue with the rescue operations. On the third attempt, the helicopter was severely damaged by an intense burst of heavy automatic weapons fire. When the helicopter lost power and crashed, Major Wofford, with complete disregard for his personal safety and despite his painful injuries, freed himself from the wreckage and then attempted to free the pilot, who was instantly killed on impact. He then observed the other members of the crew engulfed in flames and, with sheer determination and a deep concern for his fellowmen, he rushed to their aid, extinguished the flames and then dragged the aircrew members to a place of safety from which they were rescued. Through his extraordinary heroism, superb airmanship and aggressiveness in the face of an opposing armed force, Major Wofford reflected the highest credit upon himself and the United States Air Force.